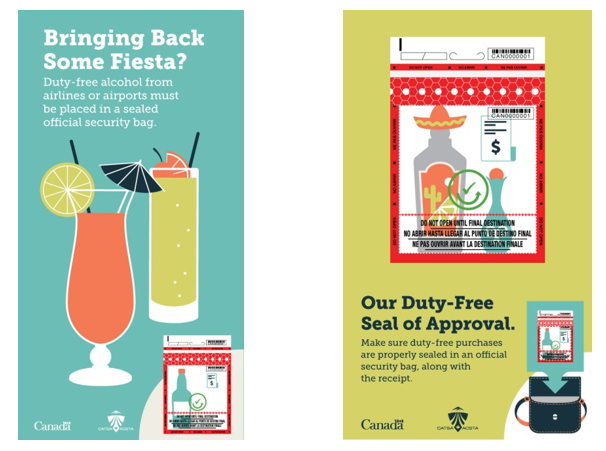 If you’re like the thousands of Canadians who will take to the air for a vacation this spring break, the Canadian Air Transport Security (CATSA) has advice that will help you go through security in no time. Good news! 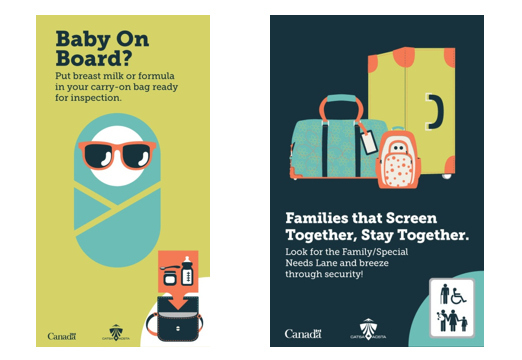 When you’re travelling with children under the age of two, you can bring liquids such as milk, breast milk and juice that exceed the 100ml restrictions in carry-on baggage. Just have the containers ready to present to screening officers for a quick inspection. For older kids, solid foods such as apples, granola bars and sandwiches can go in your carry-on without restrictions. Before you leave for the airport, make sure everyone is wearing easy-to-remove outerwear and avoid clothes with metal clasps or snaps that may trigger the metal detector. At the airport, get boarding passes ready and check for a Family/Special Needs lane. They offer extra space to accommodate larger items like strollers and car seats. 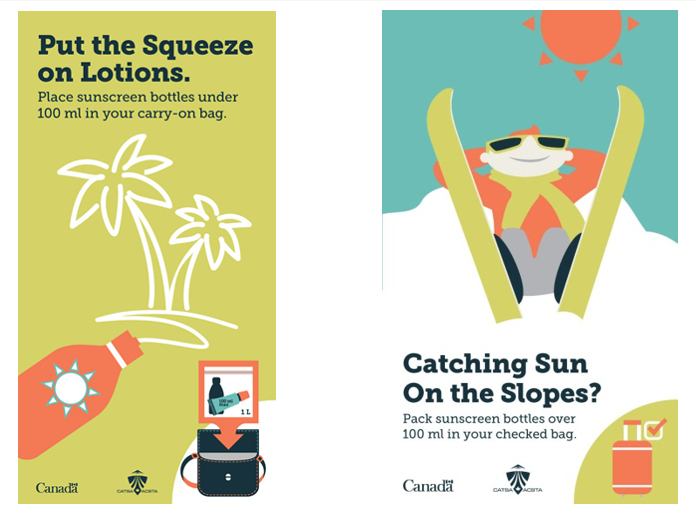 Whether you’re heading for the Caribbean or staying in Canada, sunscreen is a popular must-bring item. Just don’t get burned at security with an over-sized bottle in your carry-on bag Small bottles under 100ml are fine, but bigger bottles need to be packed in your checked baggage. Planning to race down a mountain, brave the waves or challenge the pins? You can bring large sports equipment like surfboards, snowboards, skis and golf clubs with you on your trip. Just make sure you check these items in with your airline. If you have questions about checked baggage restrictions or extra charges, contact your airline before you travel. Parting with duty-free purchases is no fun. All duty-free liquids, aerosols and gels (e.g., alcohol, perfume) in your carry-on bags are subject to screening and must be properly sealed in an official security bag, accompanied by a receipt. These bags should be provided by duty-free retailers. If you have a connecting flight in Canada on your return trip, make sure your bag is the real deal. Even better – place your duty-free items in your checked baggage. 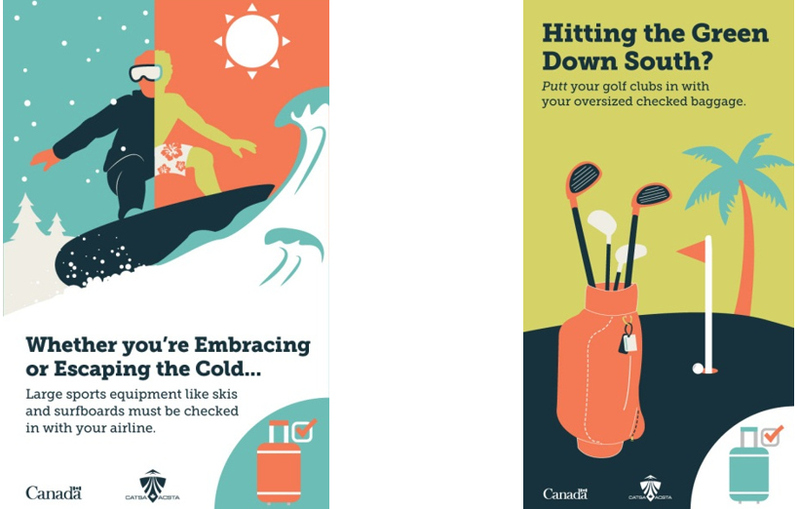 For more tips to help you breeze through security this spring break, visit CATSA at catsa.gc.ca, on Twitter (@catsa_gc) or Pinterest (CATSAGC). havent traveled in so long, I wouldnt have known half of these tips. These are some important tips, especially as I am sure the security lines will be huge! Great tips! Security screening can make or break your vacation, so a lot of your tips are really helpful and decrease the stress of it. Wow so much has changed since I traveled last. Thanks for all the tips. Security rules seem to keep changing. I only travel every year or two, so I make sure I check my airline’s rules before I pack. I hadn’t heard of a Family/Special Needs Lane though. Thanks for the information.